Abstract: Acute septic arthritis in children is usually hematogenous. It is more common in boys, and it most often affects the large joints of the lower limb. Diagnosis is based on cultures obtained from the infected joint and is supported by C-reactive protein blood test or ultrasound imaging. Staphylococcus aureus is the most common causative agent and is the primary target for empiric treatment. First-generation cephalosporins and clindamycin are suitable antibiotics. Vancomycin is utilized in areas with high rates of clindamycin- and methicillin-resistant S. aureus. After a short intravenous administration of 2–4 days, a total course of 2 weeks is sufficient in uncomplicated cases. Early antibiotic treatment has significantly improved the prognosis in high-income settings, but uncomplicated recovery is compromised if the treatment is delayed. Complications such as symptomatic osteoarthritis or avascular necrosis of the femoral head develop slowly. A long follow-up of 1–2 years is required to detect all possible sequelae. Acute septic arthritis (SA) in children is most often a hematogenous infection.1,2 The sluggish blood flow in the metaphyseal capillaries makes growing bones susceptible to infection from hematogenous seeding from any trauma or infection. SA is more common in boys than girls with a ratio of 2:1.1,2 The incidence in developed countries is 4–5 cases per 100 000 children per year.1 Most commonly affected locations in the body are the large joints of the lower limb – hip, knee, and ankle joints. Staphylococcus aureus and respiratory pathogens are the most common causative agents. Kingella kingae is a regional pathogen that has increasingly been identified as a common causative agent especially in children aged 6–36 months.3 The role of trauma in the pathogenesis remains unclear.4 In neonates, bacteria such as Escherichia coli is frequently encountered in birth canal. The diagnostic algorithm for SA is shown in Figure 1. 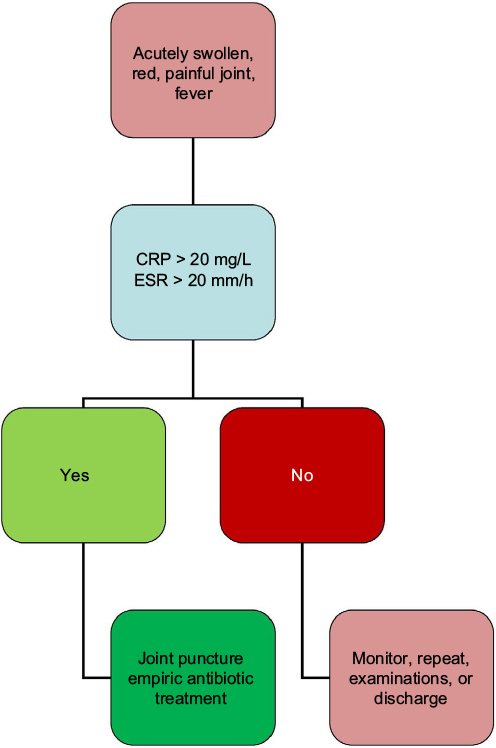 If a child with acute symptoms has elevated CRP (>20 mg/L)8 or ESR (>20 mm/h) values, a joint puncture is performed to detect any purulent aspirate and obtain a sample for bacteriology. Blood cultures are obtained. Synovial fluid findings are unspecific, but a synovial fluid sample with WBC of >50 000/μL of which >75% are polymorphonuclear cells is considered to suggest SA.8 Cultures may remain negative even in 30–70% of the cases.1,9 In addition to agar plates, it is advisable to culture synovial fluid in aerobic blood culture bottles to improve the detection of K. kingae. Plain X-ray is not very useful in diagnosis, but it may detect joint swelling or chronic osteomyelitis. Ultrasound may be used to detect joint swelling and to guide joint puncture. Magnetic resonance imaging does show swelling and is particularly useful in diagnosing adjacent osteomyelitis or an abscess, but it does require anesthesia in infants. Figure 1 The diagnostic algorithm for childhood septic arthritis. In figure 2, it shows the optimal length of antibiotic treatment for acute SA. After a short 2–4 day intravenous course, the antibiotic may be administered orally if the patient is recovering and CRP level is declining.10 A total course of 2 weeks is sufficient in uncomplicated cases.17 If an adjacent bone is involved, the antibiotic treatment should be extended to last at least for 3 weeks.18 Dexamethasone can be administered to reduce inflammation and may lead to slightly shorter hospital stay.19 Nonsteroidal anti-inflammatory agents are administered for pain relief. 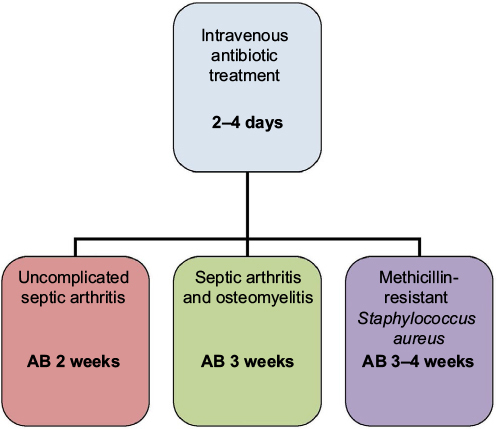 Figure 2 The duration of antibiotic (AB) treatment for childhood septic arthritis. Sequential CRP measurements offer useful information in monitoring recovery.4 ESR reacts too slowly to changes in the clinical course of illness to be useful in the follow-up. 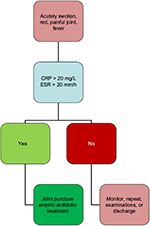 CRP <20 mg/L is a strong indicator of recovery and informs the clinician that the antibiotics can be safely stopped.8,10 Delayed diagnosis, sickle cell disease, and infection caused by Panton–Valentine leucocidin-producing strains of MRSA are considered to predispose to orthopedic sequelae,20,21 and a prolonged course of 3–4 weeks for MRSA SA is still recommended by most researchers.11 Also, the optimal length of antibiotic therapy has not been studied in patients with immunodeficiency and severe underlying illness and in the neonates, and in these cases, the therapy may have to be individualized. Relapses or reinfections are rare if large-dose short-course antibiotic treatment has been administered. 10,17 Feared complication of septic hip arthritis is the avascular necrosis of the femoral head.21 Among infants, joint effusion can result in the dislocation of the hip joint and may lead to instability requiring hip spica casting. Cartilage destruction leads to symptomatic osteoarthritis in an affected joint. The complications may develop slowly, and a long follow-up of 1–2 years may be required to detect all possible sequelae. Krogstad P. Osteomyelitis and septic arthritis. In: Feigin RD, Cherry JD, editors. Textbook of Pediatric Infectious Diseases. 6th ed. Philadelphia, PA: Saunders; 2009:725–748. Pääkkönen M, Peltola H. Management of a child with suspected acute septic arthritis. Arch Dis Child. 2012;97(3):287–292. Yagupsky P. Kingella kingae: carriage, transmission, and disease. Clin Microbiol Rev. 2015;28(1):54–79. Pääkkönen M, Kallio MJ, Lankinen P, Peltola H, Kallio PE. Preceding trauma in childhood hematogenous bone and joint infections. J Pediatr Orthop B. 2014;23(2):196–199. Ju KL, Zurakowski D, Kocher MS. Differentiating between methicillin-resistant and methicillin-sensitive Staphylococcus aureus osteomyelitis in children: an evidence-based clinical prediction algorithm. J Bone Joint Surg Am. 2011;93(18):1693–1701. Yagupsky P, Dubnov-Raz G, Gené A, Ephros M; Israeli-Spanish Kingella kingae Research Group. Differentiating Kingella kingae septic arthritis of the hip from transient synovitis in young children. J Pediatr. 2014;165(5):985–989. Sultan J, Hughes PJ. Septic arthritis or transient synovitis of the hip in children: the value of clinical prediction algorithms. J Bone Joint Surg Br. 2010;92(9):1289–1293. Pääkkönen M, Kallio MJ, Kallio PE, Peltola H. Sensitivity of erythrocyte sedimentation rate and C-reactive protein in childhood bone and joint infections. Clin Orthop Relat Res. 2010;468(3):861–866. Lyon RM, Evanich JD. Culture-negative septic arthritis in children. J Pediatr Orthop. 1999;19(5):655–659. Peltola H, Pääkkönen M, Kallio P, Kallio MJ; OM-SA Study Group. Clindamycin vs. first-generation cephalosporins for acute osteoarticular infections of childhood – a prospective quasi-randomized controlled trial. Clin Microbiol Infect. 2012;18(6):582–589. Liu C, Bayer A, Cosgrove SE, et al; Infectious Diseases Society of America. Clinical practice guidelines by the Infectious Diseases Society of America for the treatment of methicillin-resistant Staphylococcus aureus infections in adults and children. Clin Infect Dis. 2011;52(3):e18–e55. Mera RM, Miller LA, Amrine-Madsen H, Sahm DF. Impact of new clinical testing laboratory standards institute Streptococcus pneumoniae penicillin susceptibility testing breakpoints on reported resistance changes over time. Microb Drug Resist. 2011;17(1):47–52. Peltola H, Kallio MJT, Unkila-Kallio L. Reduced incidence of septic arthritis in children by Haemophilus influenza type-b vaccination. Implications for treatment. J Bone Joint Surg Br. 1998;80(3):471–473. Saphyakhajon P, Joshi AY, Huskins WC, Henry NK, Boyce TG. Empiric antibiotic therapy for acute osteoarticular infections with suspected methicillin-resistant Staphylococcus aureus or Kingella. Pediatr Infect Dis J. 2008;27(8):765–767. Sherman JW, Conte JE Jr. Ceftriaxone treatment of multidrug-resistant salmonella osteomyelitis. Am J Med. 1987;83(1):137–138. Bradley JS, Jackson MA; Committee on Infectious Diseases; American Academy of Pediatrics. The use of systemic and topical fluoroquinolones. Pediatrics 2011;128(4):e1034–e1045. Peltola H, Pääkkönen M, Kallio P, Kallio MJ; Osteomyelitis-Septic Arthritis (OM-SA) Study Group. Prospective, randomized trial of 10 days versus 30 days of antimicrobial treatment, including a short-term course of parenteral therapy, for childhood septic arthritis. Clin Infect Dis. 2009;48(9):1201–1210. Peltola H, Pääkkönen M. Acute osteomyelitis in children. N Engl J Med. 2014;370(4):352–360. Fogel I, Amir J, Bar-On E, Harel L. Dexamethasone therapy for septic arthritis in children. Pediatrics. 2015;136(4):e776–e782. Carrillo-Marquez MA, Hulten KG, Hammerman W, Mason EO, Kaplan SL. USA300 is the predominant genotype causing Staphylococcus aureus septic arthritis in children. Pediatr Infect Dis J. 2009;28(12):1076–1080. Ilharreborde B. Sequelae of pediatric osteoarticular infection. Orthop Traumatol Surg Res. 2015;101(1 Suppl):S129–S137. Givon U, Liberman B, Schindler A, Blankstein A, Ganel A. Treatment of septic arthritis of the hip joint by repeated ultrasound-guided aspirations. J Pediatr Orthop. 2004;24(3):266–270. Pääkkönen M, Kallio MJ, Peltola H, Kallio PE. Pediatric septic hip with or without arthrotomy: retrospective analysis of 62 consecutive nonneonatal culture-positive cases. J Pediatr Orthop B. 2010;19(3):264–269. Agout C, Lakhal W, Fournier J, de Bodman C, Bonnard C. Arthroscopic treatment of septic arthritis of the knee in children. Orthop Traumatol Surg Res. 2015;101(8 Suppl):S333–S336. Edmonds EW, Lin C, Farnsworth CL, Bomar JD, Upasani VV. A medial portal for hip arthroscomy in children with septic arthritis: a safety study. J Pediatr Orthop. Epub 2016 Sep 3. Lavy CB. Septic arthritis in Western and sub-Saharan African children – a review. Int Orthop. 2007;31(2):137–144.